For those who have grown accustomed to the thrill of seeing South Philadelphia High School, 2101 S. Broad St., battle Ss. Neumann-Goretti High School, 1736 S. 10th St., in Thanksgiving Day gridiron action, this holiday’s 10 a.m. alteration of that familiar and eight-decades-strong matchup will certainly prove awkward yet will not lack for local laurels. Due to the latter’s October cancellation of its remaining slate on account of a reduced roster, the Rams will instead look to batter the Griffins from The Academy at Palumbo, 1100 Catharine St., at the South Philly Supersite, 10th and Bigler streets. The former East Passyunk Crossing dweller possesses additional awareness of the mystique surrounding the typical tilt between the parochial institution and its public nemesis through having been Southern’s head man for two campaigns. 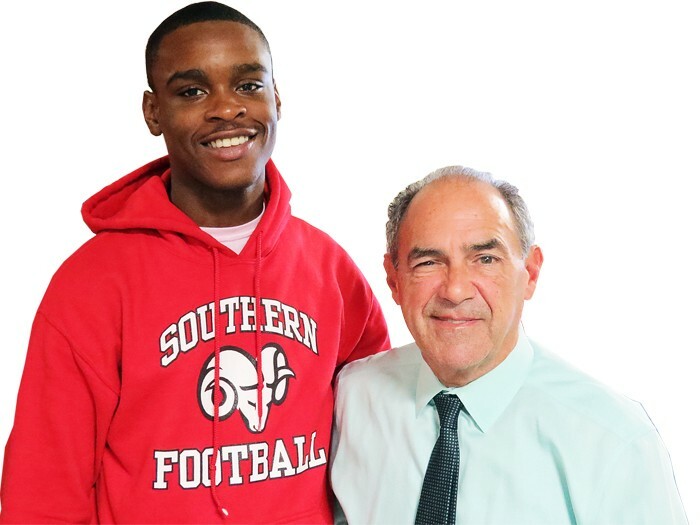 As the lone coach Palumbo has had in its three-season pigskin annals, he is always encouraging his charges to consider the gravity of each moment, with the opportunity to take on a fellow South Philly school certainly a compelling blessing. He and the Griffins are the beneficiaries of Neumann-Goretti’s need to halt its involvement in the Turkey Bowl. For the aforementioned reason, head coach Lincoln Townsend and his players, having already decided to forfeit their two remaining Catholic League Blue dates, will not compete and thus will give spectators a shot at seeing two public league institutions look to make a memorable morning. Considering that Palumbo, which struggled mightily its first two years of existence, captured its division title and enters, at 5–5, with a winning season on the line, the stage is set for such an unforgettable affair. Headed for the University of Maryland as Palumbo’s first Division I pigskin signee, Bennett has proven a menace on both sides of the ball and will look to do damage to Southern’s defensive schemes and cause fits in his secondary role as a member of the Griffins’ secondary. IN HOPING TO head back to his Garden State home a victor, the eager coach will need for his hungry bunch to devour the ambition of a program well-versed in holiday hoopla. Though possessing a losing record on Thanksgiving due to powerful performances from Neumann-Goretti, formerly Southeast Catholic, Bishop Neumann, and Saint John Neumann High School, Southern has always delighted in experiencing the spirit of the a.m. clashes, and Manier Kennedy expects for his final game as a Ram to prove a testament to his school’s tenacity. The Grays Ferry inhabitant has nagged adversaries in the aforementioned positions and as a kick returner, gladly showing his resolve to his contemporaries and Natale. Natale’s roster benefits from multiple co-op agreements, with registrants from Universal Audenried Charter High School, 3301 Tasker St.; Horace Furness High School, 1900 S. Third St.; and the Girard Academic Music Program, 2136 W. Ritner St., adding local flavor to the proceedings. In making the pitch to Pitzner to have Palumbo play in place of Neumann-Goretti, the revered coach, who will helm his third Thanksgiving game for the Rams, felt it would be “a perfect pairing” and contends that it will yield fascinating matchups, including Bennett versus Kennedy. Manier Kennedy will look to reach the end zone multiple times for coach Frank Natale.